Is Peer Lending Too Risky for Regular Investors? The peer lending movement has picked up steam over the last few years but is still not well-known among the investing public. Risks abound, both real and imagined, and I even posted an article recently comparing the movement to the Wild West of the American 19th century. While most investors are still cautious about stepping into this new era of investments, I can honestly say that in ten years I think it will be a staple of nearly everyone’s financial planning. Not only can peer lending help you achieve a higher return on your investments, but it can actually help lower the amount of risk in your portfolio. Higher return and lower overall risk…the question may not be whether peer lending is too risky for your portfolio but is the risk of not meeting your financial goals too high without peer loans? How Risky is Peer Lending? Returns over the last five years have been very good in both cases. The return to June 2014 on loans originated on Prosper over the four years to August 2013 has been 9% for all loans and as high as 10.8% for loans in one of the higher-risk categories. Rates (as they generally are) are slightly lower in the UK, but at near to 7% in our review they trump savings rate and any “fixed term” interest rates that the banks offer. The loans on Prosper and Lending Club are unsecured, meaning they’re not backed by a home or car. If the borrower defaults, you do not have any recourse but the lending websites do send the debt to a collection agency to recoup as much as possible. Loss rates can get fairly high for the high-risk loan categories but many investors stick with the safer loan categories and see default rates well under the average for all consumer loans. The loss rate on A-rated loans on Prosper was just 3.5% and the actual return, even after defaults, was still 6.5 percent. This is similar to Funding Circle in the UK, which Moneystepper’s review is based on. 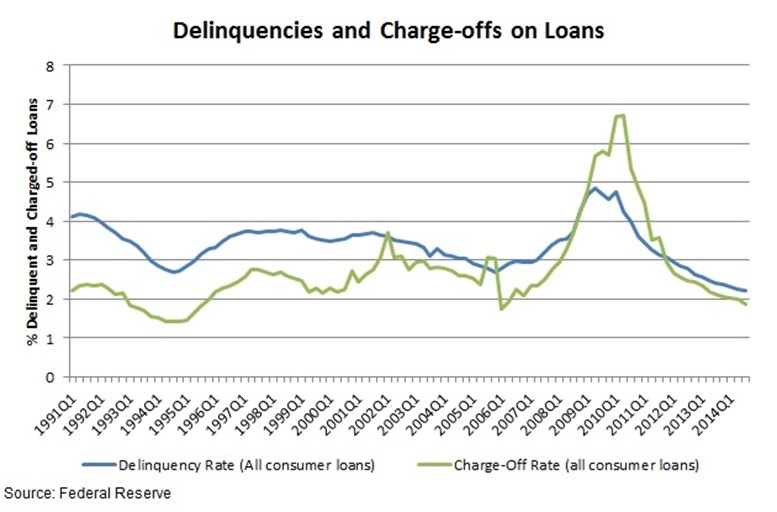 Gross rates are from 8% – 13%, but after bad debt and fees, the net return after default is around 6% (as proven by the test performed in the linked article above). The difference here is that the “peers” are businesses rather than individuals and hence many of the loans are secured against the directors’ assets. Asked about whether peer loans are too risky for most investors, I always have to wonder where the person asking the question was over the last decade of stock market returns. Does anyone remember 2008 when stocks in the S&P 500 lost more than half their value over a 12-month period? 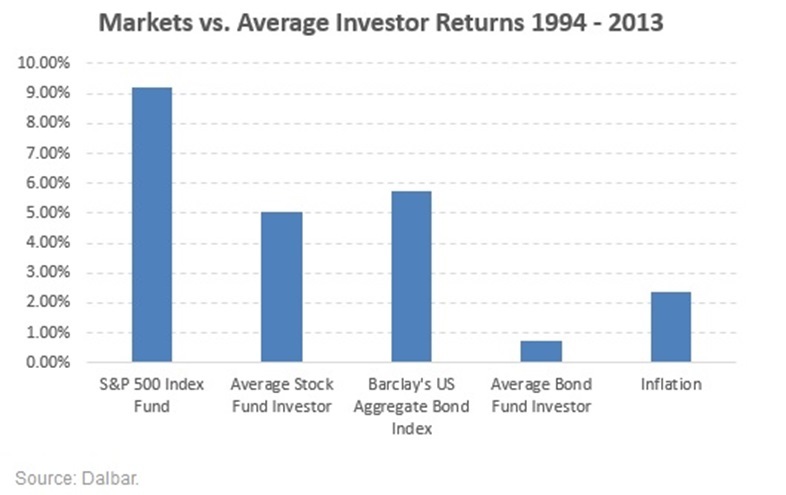 While shares of stocks have offered an average return around 9% over the last couple of decades, the volatility around that average has been 20% over the last ten years. Even relatively safe bonds are not safe from a skittish market. Shares of a diversified bond fund, the iShares Core U.S. Aggregate Bond (NYSE: AGG) plunged 6.8% on October 10th in 2008 and losses over a give period often eat into gains on interest payments. Risk isn’t the only thing to worry about in stocks and bonds. Time and again investors are proven to be their own worst enemies in investing. A study by research firm DALBAR shows that the average investor fails to earn anything close to the market’s return due to poor investment behaviors. Euphoric-buying as the market peaks, followed by panic-selling when it comes back down leads to horrible returns for the average stock and bond investor. In fact, bond investors actually lost money after accounting for inflation over the two decades to 2013. Besides good returns and relatively low risk against other investments, peer loans offer a great opportunity to diversify your investment portfolio. The idea behind diversification is to put your money on different investment types that will react differently to the economy and other factors. If the economy tanks and stocks lose their value, your investments in bonds will not drop as much and you won’t see your overall portfolio value crumble. Using the S&P Experian Consumer Credit Default Index as a measure of peer loan performance, we see a big increase in diversification when added to a stock and bond portfolio. The correlation of the default index with stocks and bonds, a measure of how closely the investment returns follow each other, is negligible at 0.014 for stocks and 0.28 with bonds. This means that if stocks and corporate debt were to lose their value in a market crash, your peer loans might hold up pretty well and you won’t have to see your nest egg melt away. Of course, as the owner of a blog on peer lending, I have a special interest in the topic. You will have to make your own decision whether peer loans fit into your long-term investment strategy. There are few formal investment advisers for peer lending so it may not be as easy as letting your financial adviser pick when to buy and sell stocks. Then again, how well did your financial adviser do for you in 2008? What I can tell you is that, following a conservative strategy of investing, adding peer loans to your investment portfolio can help lower the risk and increase returns in your overall wealth. Description: Peerloansonline.com is your first stop into the world of peer lending. Whether a borrower or an investor, you’ll find everything you need to make your experience a success along with tips on personal finance and managing debt. How is the peer-to-peer lending industry changing? State law (Michigan) prohibits peer to peer lending as a potential opportunity, so it’s never something that I’ve even been able to consider, but it is intriguing. I have seen results that are overall favorable but even the most successful reports include a charge-off now and then. @moneybeagle, You are able to invest on Lending Club through a folioFN account in Michigan. While many states still do not allow peer lending as an investment, I expect this to change in 2015. The Lending Club IPO will bring a lot of attention to the market and investors will start to pressure local governments. I’ve got a review of the two peer lending platforms on my site that lists where investing is still not allowed (about 23 states for each of the platforms). All but five states allow investing through a folioFN investment account. I’m in Canada, and unfortunately we don’t have any P2P platforms here, otherwise I’d be all over it. I don’t see P2P as being more risky, and I think it’s a nice way to cut out Big Brother (the big banks) and create a bit more of a community. Thanks to give information about the risks in peer lending.